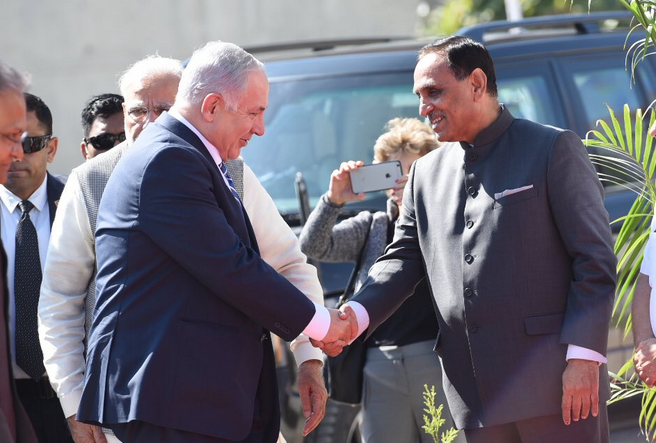 Gandhinagar: During recently concluded his six-day long visit to Israel, Gujarat Chief Minister Mr. Vijaybhai Rupani held a series of meetings including the meetings with Israeli Prime Minister Benjamin Netanyahu and agricultural minister Uri Yehuda Ariel for detail deliberations on issues like agro farming, desalination plants and other technologies. As an outcome of these meetings, Gujarat has signed as many as 16 MoUs with Israel on issues pertaining to agriculture, water management-start-up innovation – smart city and other sectors. These MoUs included three MoUs signed for the water management. Rupani and his delegation visited desalination plants, agro-farming and others. For the implementation of MoUs and proper planning, a high power committee has been formulated. Besides Chief Minister, this committee includes Deputy Chief Minister Nitin Patel, Education Minister Bhupendrasinh Chudasama, Agriculture Minister R.C Faldu, Energy Minister Saurabh Patel, Revenue Minister Kaushik Patel, Minister of State for Home Department Pradeepsinh Jadeja, Minister of State for Water Supplies Parbat Patel, Minister of State for Agriculture Jaydrathsinh Parmar, Chief Secretary Dr. J.N Singh, Additional Chief Secretaries namely M.S Dagur, Arvind Agrawal , Sanjay Prasad, Chief Principal Secretary to the CM K. Kailashnathan, Principal Secretary to CM M.K Das, Additional Secretary of Water Supplies Department J. P Gupta, Secretary to CM Ashwini Kumar; in addition to Secretary for Home Department Manoj Agrawal, and Secretary of Animal Husbandry Department Mohammad Shaahid, Director of Agriculture Bharat Modi, and Director of Horticulture Vaghasiya. A sub-group would be made operational under the chairmanship of J. P. Gupta, principal secretary (water supply) for the follow-up and monitoring of the water management. A MoU has been signed with Israel’s Mekorot Company, which is the national water company of Israel, for strengthening water distribution and water management system in Gujarat. The Chief Minister had also visited the IDE Group, which is an Israeli water desalination company, and invited it to set up desalination and waste water treatment plants in Gujarat. Rupani and his delegation also visited the world’s biggest desalination plant, which is called Sorek. It is located about 15 km away from Israel’s capital city, Tel Aviv. The plant is built at a cost of 400 million US $ and made operational since 2013. The plant is producing 660 M.L.D. of drinking water per day from salty seawaters. The Chief Minister and visiting Gujarat delegation also studied the advance technologies with a view to set up 10-odd desalination plants on seashore of Gujarat, Saurashtra and Kutch regions to resolve the water scarcity problems of the state. Rupani also visited the Shafdan wastewater treatment plant, located in Dan region near Tel Aviv. Israel is using 85% of waste water. This technology could be very useful for Gujarat too! As the desalination plants are using maximum electricity, the Chief Minister had also invited the Israeli companies to jointly installed solar parks in Gujarat for producing solar energy. Chief Minister’s visit would be fruitful in giving water security to Gujarat till 2050, claimed the government in a note.